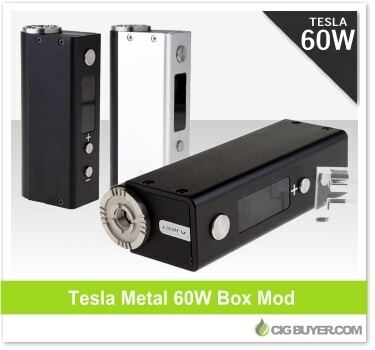 One of the latest mods from Tesla, the Tesla Metal 60W Box Mod is an attractive device offering up to 60W of power in a affordable and compact package. It features a 0.8″ OLED screen to display battery level, voltage, resistance and wattage; along with an adjustable silver plated copper center pin, recessed 510 connection with air channels and a variety of built-in safety features. It takes a single 18650 battery and can fire atomizers at an EXTREMELY LOW 0.18 ohms.